Good. Has been rebound in a library hardback cover. Ships from UK in 48 hours or less (usually same day). Your purchase helps support the African Children's Educational Trust (A-CET). Ex-library, so some stamps and wear, and may have sticker on cover, but in good overall condition. 100% money back guarantee. We are a world class secondhand bookstore based in Hertfordshire, United Kingdom and specialize in high quality textbooks across an enormous variety of subjects. We aim to provide a vast range of textbooks, rare and collectible books at a great price. Through our work with A-CET we have helped give hundreds of young people in Africa the vital chance to get an education. We provide a 100% money back guarantee and are dedicated to providing our customers with the highest standards of service in the bookselling industry. Acceptable. Used-Acceptable. Sticker on cover. Contains some pen and pencil markings. Edges of pages are lightly stained. Has been rebound in a library hardback cover. Ships from UK in 48 hours or less (usually same day). Your purchase helps support the African Children's Educational Trust (A-CET). Ex-library with wear and barcode page may have been removed. 100% money back guarantee. We are a world class secondhand bookstore based in Hertfordshire, United Kingdom and specialize in high quality textbooks across an enormous variety of subjects. We aim to provide a vast range of textbooks, rare and collectible books at a great price. Through our work with A-CET we have helped give hundreds of young people in Africa the vital chance to get an education. We provide a 100% money back guarantee and are dedicated to providing our customers with the highest standards of service in the bookselling industry. Good. Women's America, the popular text in American Women's Studies and History, has been extensively revised in this edition. It contains approximately fifty new pages worth of essays, documents, illustrations, and bibliographic material. Trade paperback (US). Glued binding. 751 p. Contains: Illustrations, black & white. 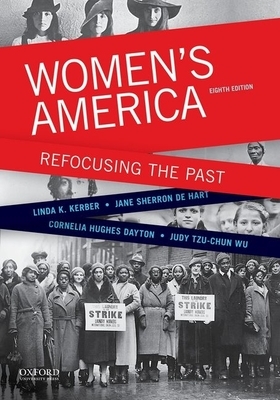 Women's America: Refocusing the Past is an extremely good text for anyone studying women's history because of its contributors and primary sources. Each essay includes a primary source (e.g. diary excerpts, old newspaper articles, etc.) and commentary. Some of the stories are so interesting and realistic, they make me love history even more.